Minerality: Soil's Expression or Scientific Fact? This article will discuss the factors—both genetic and learned—which explain how we determine flavor and rate wine quality and why there is so often disagreement among tasters. Part I will discuss sensation—the way in which we detect the physical characteristics of a wine through our sense of taste, smell and touch, how the different taste sensations interact and the consequences for pairing food and wine. Part II will explore perception—how the brain interprets sensory information and how this information will have a different underlying meaning according to the individual taster’s prior experience; and why the same wine will evoke different thoughts and feelings in each of us because of the way smell and memory are wired in the brain. The sense of smell, or olfaction, is more complex than taste. While taste consists of five sensations (sweet, sour, salty, bitter and umami), a master perfumer or trained wine taster can recognize dozens of odors. And unlike taste preferences, which are hard-wired from birth, preferences for odors are for the most part learned through experience. Primitive vertebrates relied heavily on their sense of smell for survival reasons such as mate selection and detecting of predators and prey. We no longer rely as much on our sense of smell to get around. In fact, compared to vision and language, a minor part of our brain is devoted to smell. The implications this has on wine tasting will be discussed further in Part II [see ‘The De-evolution of Smell’]. Sniffing a wine brings the aromas in contact with the smell center, which is one square inch in size and located at the top of the nasal cavity, behind the eyes. Smelling nasally tells you how old a wine is, its fruit characteristics, grape variety and defects such as oxidation or corkiness. When you take a sip of wine, because the mouth is connected to the nose via the retro-nasal passage, you smell the wine again. You don't think about it, but as you swallow, your mouth is closed, forcing you to exhale through your nose. In so doing, the residual wine vapors in your mouth are carried—retro-nasally—to the smell center. Swallowing aides retro-nasal olfaction; expectorating limits retro-nasal olfaction and therefore our ability to fully appreciate a wine's aromas. 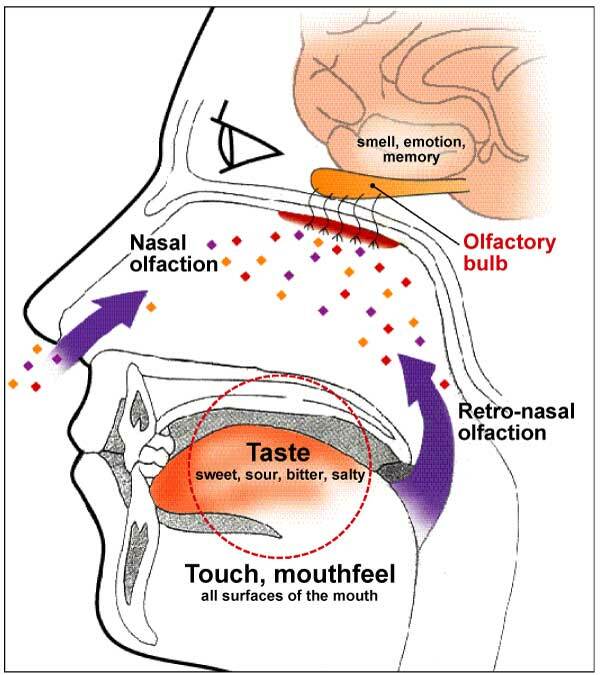 Retro-nasal olfaction takes aromas to the same smell center, except from the opposite direction. As the wine warms up toward body temperature in the mouth, it releases a wider spectrum of aromas, revealing secondary and tertiary aromas, seconds after swallowing. Some minor aromatics drop out, but the overall aroma increases. Wine tasters noisily draw air into the mouth to move odor molecules through this retro-nasal passage to better smell (not taste) the wine. While the wine is in the mouth, we both taste and smell it. The fact that we use the word taste to describe all these in-mouth sensations when we mean smell shows how we underestimate the contribution our sense of smell makes to flavor. When you have a cold (or pinch your nose) both the nasal and retro-nasal routes are blocked, shutting down your sense of smell and making it difficult to tell the difference between a sauvignon blanc and a gewürztraminer. Bartoshuk’s research shows a correlation between our sensitivity to taste and the number of fungiform papillae, the large bumps on the front of the tongue, each of which contain 5-6 taste buds. Surrounding each taste bud are sensors sensitive to alcohol and tannin. So, in addition to tasting sweet, sour and bitter more intensely, a supertaster would also get more “pop” from an astringent, high alcohol wine than a normal taster would; something to consider when discussing the relative merits of a wine with a fellow taster. Astringency from tannin is an important mouthfeel characteristic of red wines. Astringency is often referred to as bitter, but bitter is a taste and astringency is a tactile or touch sensation. Evidence for this is that we feel the dry, puckering sensation of tannins on our cheeks and gums - where there are no taste buds. The roughness we feel in our mouth is a result of tannins binding to and removing salivary proteins, which function to lubricate the mouth. It is difficult to accurately evaluate a series of tannic red wines because tannins accumulate in the mouth causing carryover effects from one wine to the next. “It’s a cumulative process,” Breslin states. “If you’re going to drink several sips of a tannic wine in rapid succession you might expect that it would get more astringent with each successive sip. The only way to counter that is to put a lubricant back in the mouth which can either be done by stimulating salivary secretion which high acidity does or, a lot of wines come with their own lubricant, glycerol.” The lubricating ability of a fatty steak explains its compatibility with a tannic red wine. An important characteristic of the sense of touch is that it is less sensitive at lower temperatures. The same wine will have less mouthfeel and body at lower temperatures and become more full-bodied and textured as the wine warms up. White wines are frequently served too cold, diminishing their mouthfeel and therefore flavor (Part this reduction in flavor is because our sense of smell is reduced. Aromas will not be as volatile and will simply fall off the olfactory radar screen). The two exceptions are sparkling wines, which must be served cold to retain the carbon dioxide (try drinking a can of warm soda) and wines with residual sugar, which can be cloying at room temperature. There is also less heat from alcohol at lower temperatures. Interestingly, the different taste qualities have the potential to inhibit or cancel out each other, a starting point in explaining why certain food and wine pairings work. A mixture of bitter and sweet is less sweet than an equal amount of sugar tasted alone. Sour (acidity) and sweet suppress one another. Adding sugar to lemon juice reduces the tartness; the sourness is the same but the perception of it has changed. If you taste two German Rieslings with identical residual sugar, one may taste less sweet because it is higher in acidity. Just as higher acidity reduces the perception of sweetness, higher residual sugar lowers the perception of acidity. Sweetness also suppresses bitterness, which is why we often add sugar to grapefruit and espresso and why a winemaker will retain some residual sugar to hide bitterness. Sweet wines such as Port compliment Stilton because salt and sweet suppress or balance each other. A sweet wine goes beautifully with a vinaigrette dressing because the sugar compliments the vinegar’s acidity. Adaptation is a common phenomenon of the senses and is an important factor in how food and wine interact with each other. Adaptation is a fatigue-like process where continued exposure to an odor or taste results in a decline in sensitivity to that odor or taste. An example of olfactory adaptation is when the cooking odors you notice upon entering a kitchen soon subside. When you put on cologne or perfume, you no longer smell it after a few minutes. The perfume molecules are still present but you no longer perceive them because the brain is protecting itself from an overload of redundant information. Trichloroanisole (TCA), the chemical compound responsible for corked wine, has the ability to rapidly fatigue olfactory receptors. After a whiff of this distinctive ‘wet basement’ aroma, it can disappear, only to return after the nose has regained its sensitivity. Taste adaptation is more common in wine tasting. The two primary taste components that contribute to a balanced wine are sweetness and acidity. If you remove one, you reveal the other, throwing the wine’s balance out of whack. I was sipping a glass of off-dry Riesling at a Manhattan restaurant when I began eating sugarcoated pecans. My sense of taste adapted to the pecans’ high sweetness level. With the bar for sweetness raised in my mouth, I was unable to taste the sweetness in the wine, which then tasted excessively tart. Think about how orange juice can taste tart when consumed with pancakes and maple syrup. Dr. Marcie Pelchat, an Experimental Psychologist at the Monell Chemical Senses Center discusses the opposite scenario: the effects of adaptation when eating a green apple with a glass of Chardonnay. She explains, “The sourness in the apple will reduce your sensitivity to the wine’s acidity. Without acidity, the wine will lose its brightness and seem insipid. And you adapt to the sweetness of the apple so the wine will lose any residual sugar, revealing the acidity and perhaps the oak.” Similarly, the vinegar in a salad dressing neutralizes the wine’s acidity, making the wine taste dull or flat. 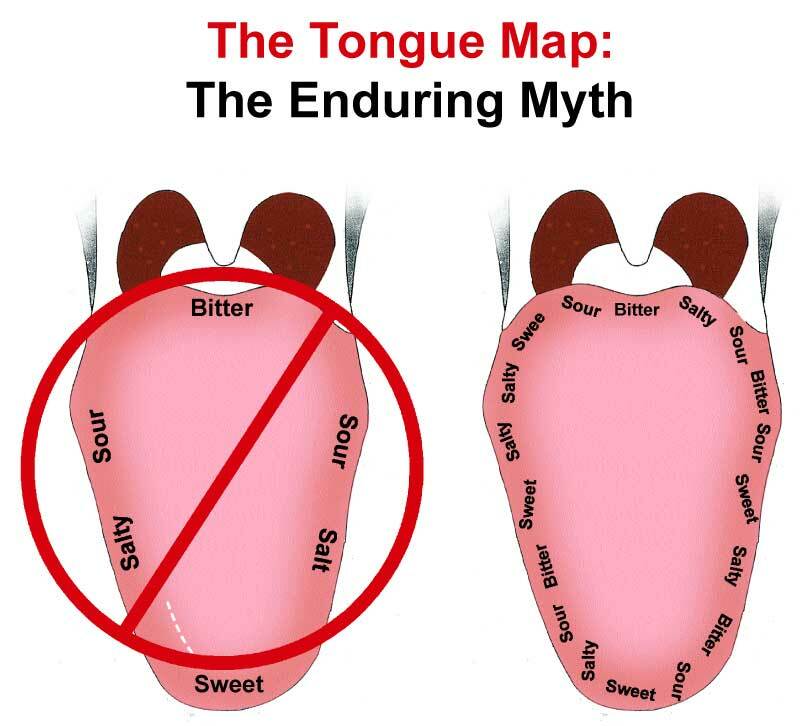 During normal eating, taste adaptation is prevented because the food is constantly being moved around the mouth so that a single taste sensation (sweet, acid, bitter or salty) is never bathing a given taste bud long enough to cause fatigue. 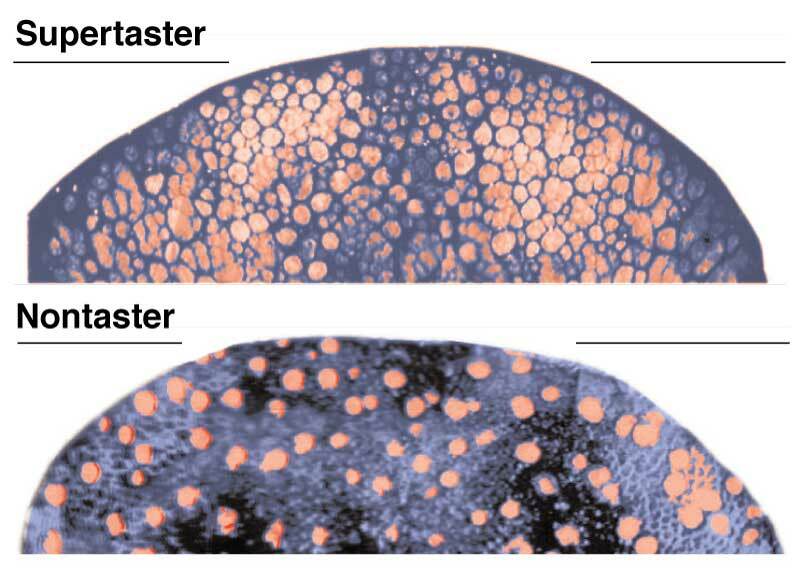 Under other circumstances, such as when you pair a wine and food, either of which contains a strong taste sensation, or when you taste a series of wines without rinsing, the effects of adaptation can be enormous.